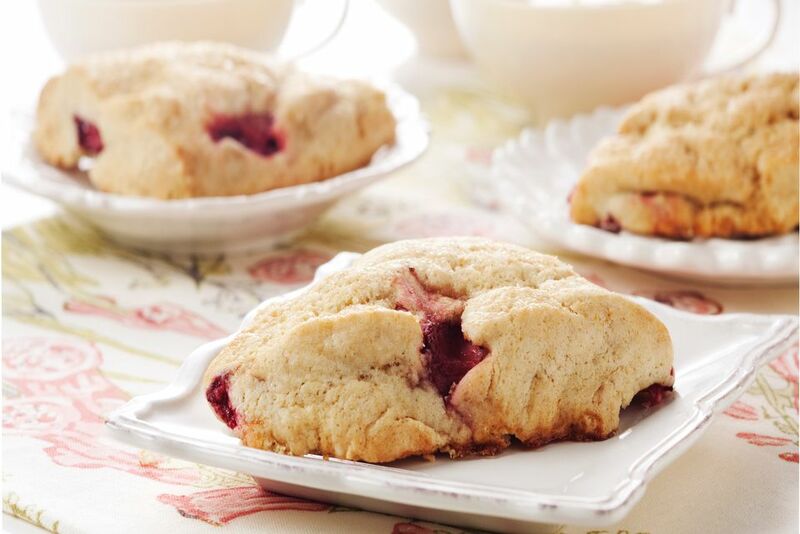 Here's a recipe for strawberry scones that are sweet, nutty and deliciously moist. Fresh strawberries are best, but frozen strawberries will work, too. Just thaw them enough so that you can give them a quick chop before adding them to the dough. Three important tips: First, don't overwork the dough, whether it's when you're bringing the dough together or rolling it out. If you do, the glutens in the flour will overdevelop and your finished scones will come out too tough and hard. And second: Use fresh baking powder! If it's been more than six months since you bought the baking powder in your pantry, you should replace it. And if you don't know how long it's been, replace it anyway. Baking powder loses its potency quickly, and your scones won't rise properly if it's too old. And third: Weigh your flour! It's the only way to get the measurements right. Scooping straight out of the bag is notoriously inaccurate. You can read more about measuring your ingredients in baking. For triangular scones, turn the dough out and separate it into two halves. Form each half into a roughly circular shape, being careful not to overwork the dough. Then roll each half to one-inch thickness and cut into wedges with a knife. Proceed with remaining steps as written. For a lower-fat version, substitute one small container (6 ounces) of vanilla, orange, or lemon yogurt (or even strawberry, if you can't get enough strawberry in your strawberry scones) for the heavy cream. Prepare your baking sheet pan by greasing it with butter or shortening or lining it with parchment paper. Or use a silicone baking mat, which is my favorite technique. Beat one of the eggs along with a tablespoon of water in a small bowl and set aside. In a large mixing bowl, combine flour, baking powder, sugar, and salt. Cut in the butter until the mixture resembles large crumbs. In a separate bowl, beat the remaining two eggs and stir in the cream and almond extract. Stir the egg-cream mixture into the dry ingredients and then stir in the chopped strawberries. Turn the dough out onto a floured board and press it together into a single lump. If it doesn't hold together yet, add more cream, a tablespoon at a time, until it does. But don't overwork the dough or your scones will turn out hard. Roll the dough out to a thickness of one inch. But don't spend too much time rolling it or you'll overwork it and end up with tough scones. Cut the dough into rounds with a round or fluted pastry cutter. Place scones on your prepared baking sheet. Brush the tops of the scones with the egg wash from earlier. Transfer the pan to the oven and bake 15 minutes or until golden.